We forge a strong connection between the landscape and the home to achieve a natural tone and softened counterpoint to modern home building materials like concrete and steel. Every home we design a landscape for is unique, and we like that because it gives us the opportunity to stretch our landscape chops and grow as designers and craftsmen. Over 30 years in the business no two projects have been alike! In recent years we’ve been sought after for more contemporary, modern landscape designs. Our knowledge of plant materials and innovative landscape ideas serve homeowners who envision an outdoor environment that nicely complements the cutting-edge architecture of their home. 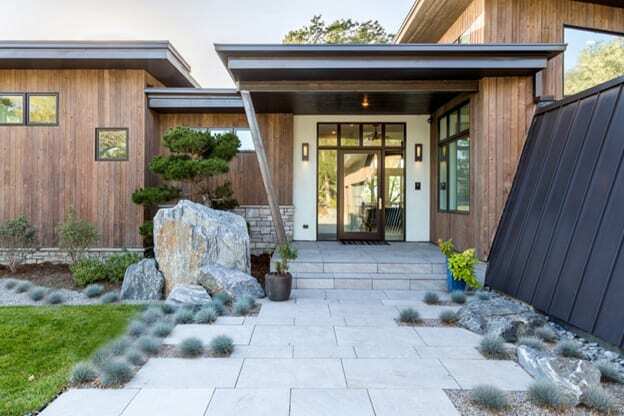 We pay homage to modern homes with low-maintenance plantings and swaths of ornamental grasses to add movement and depth to what may be a concrete and glass, perhaps even stark structure. We’ll incorporate subtle and unexpected design elements through structural elements like boulders, beautiful gates and stairways, water features, and outdoor sculpture to set a tone that expresses the home’s character without looking or feeling overbearing. We strive to forge a strong connection between the landscape and the home to achieve a natural tone and softened counterpoint to modern home building materials like concrete and steel. As always, our landscape designs combine beauty and function for the homeowner, so that their outdoor spaces meet and exceed their intentions for use. Outdoor Craftsmen adheres to a refined, elegant aesthetic in all our work. That extends to even the most modern style requests through bold design and thoughtful integration with the natural environment.